The old stone commemorating Thomson is known locally as the 'Bloodstone'. Locals claim that the small hole on the headstone will cause the finger to bleed if it is inserted within it. The actual cause of the redness found on fingers so inserted is obtained from a red ochre vein than runs through the stone, however the story is one that is popular with children! 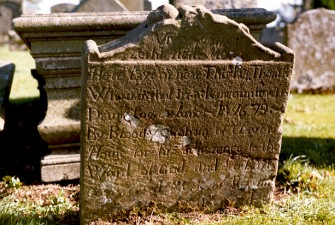 Buried in Stonehouse is James Thomson, who was a farmer at Tanhill, which is still located near to Blackwood, just over the boundary of Stonehouse parish, in the parish of Lesmahagow. James Thomson was active at the Battle of Drumclog on 1 June 1679, where the Covenanters had a victory over Graham of Claverhouse's troops. However, a few Covenanters were killed, Thomson being one of these, dying of wounds received. Two stones mark Thomson's grave. 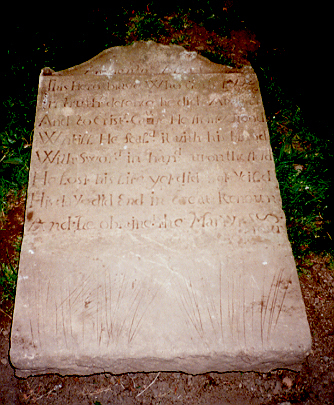 The oldest was erected in 1734 and is a small headstone. Unfortunately, at some point it received a breakage which was subsequently repaired. In 1832 descendents had a new marker stone erected adjoining the old stone. It is also known that James Thomson's wife and their only son were captured at some point and imprisoned in Blackness Castle, on the shores of the Firth of Forth. What happened to them is unknown.